Milled rice is purchased from many parts of Thailand due to its origin.Jasmine rice: from the Lower Northeast such as�Surin, Buriram, Sisaket, Ubon Rachathani, and Nakon Rachasima. White rice: from Central Thailand and the Lower North such as Supanburi, Chainat, Saraburi, Nakon Sawan, Pichit, and Pitsanulok. Glutinous rice: from the Upper North such as Chiangrai, Payao, and Chiangmai as well as from the Northeast such as Udonthani and Konkaen. The silos have good ventilation and permits the circulation of air which allows long-term storage without compromising the quality of rice. Each silo is securely sealed and prevents entry of pests from outside. The contents of silos can also be fumigated to prevent pest proliferation. 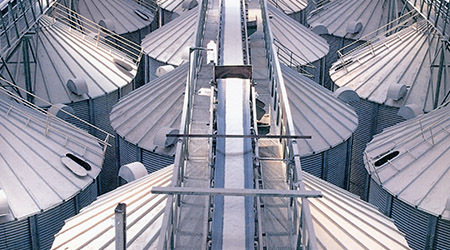 In addition,�silo storage allows better and more consistent control of raw material use, resulting in a higher overall quality of processed rice. 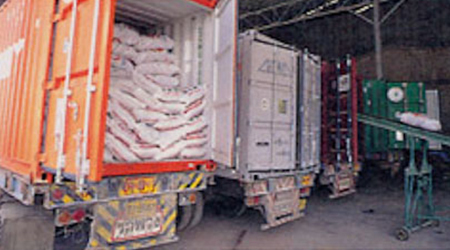 Milled rice�from upcountry still usually have mixed in with�some unwanted foreign matters. To remove these, the rice is passed through various sizes of grates. 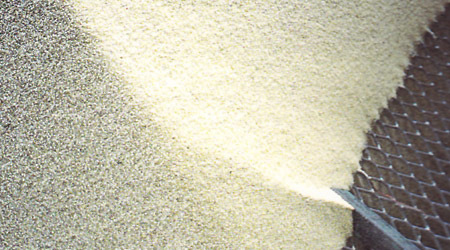 After the grains of rice have fallen through, objects larger than the grains remain on top and are then removed, while dust and debris are blown off by a powerful suction fan system. The milling of paddy involves the use of small pieces of silicon to whiten the grains of rice after the husk has been removed. 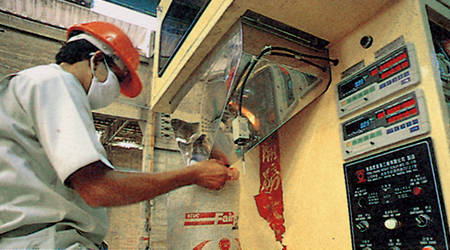 The chunks of�silicon thus become mixed in with the milled rice. 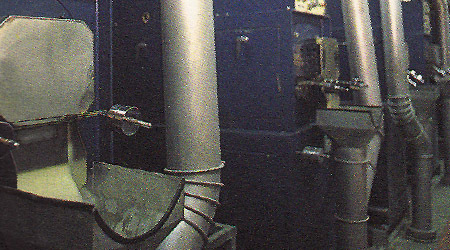 To separate them, a stone removal machine agitates the rice and stones, which have different densities and thus tend to move apart as the vibrations continue, until the silicon can be disposed. The purpose of a polishing machine is to make the rice grains look better and cleaner. A spray of water under high pressure is directed onto the grains, which are heated with the friction produced by constant jostling. This spray can induce a kind of glaze on the grains' surface, making them smooth, shiny, and more appetizing. 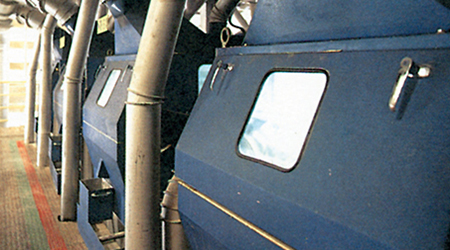 During this process, dust from the brown outer part of the rice grains is suctioned off as well. The various processing stages described earlier tend to cause some of the rice grains to break. The removal of broken grains can be done either by using the angular sifter or the circular sifter. These two kinds of sifters can be adjusted to separate out varying proportions of broken grains, according to the grade of rice desired. 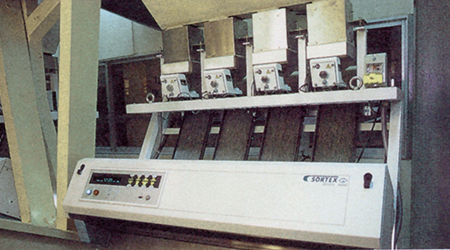 The sortex color sorter is designed to seperate grains that are not consistent with each other in terms of color. As a result, stones, seeds, and other foreign granules are not mixed in with the rice. 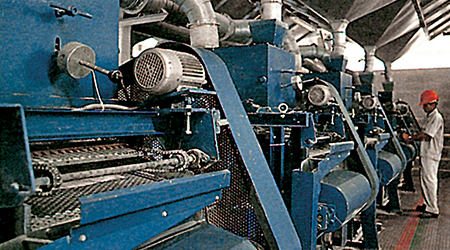 A packing machine handles the final stage of the production process. The rice is conveyed to a container for weighing by a load cell. When the correct weight is attained, the flow of rice stops. 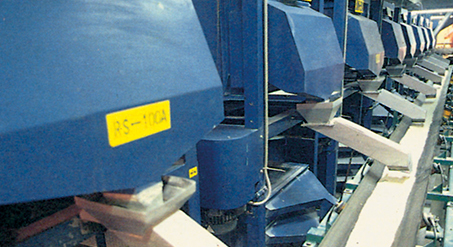 This automatic allotment of the correct quantity per bag ensures accurate and consistent packing. The net effect of these advantages is to provide TMP a considerable competitive edge in the world��s market, enhancing thereby the success of its marketing operations and boosting Thai exports.